Because beauty should be fun! Phew, summer has really hit, hasn’t it? In New Zealand it’s in full swing, and I’m already reliant on my desk fan. Summer isn’t really for me – I’m more of an autumn/winter girl – but it’s nice to wear all my pretty dresses and sandals, as well as not having to wrap myself in layers of blankets! Plus everyone is just so much happier in the summer. It must be all that vitamin D! I have very pale skin which I like to joke gets moon burn, so the sun just isn’t my friend, sadly. I use a lot of sunblock and sit in the shade as much as possible, but sunblock, sweat, dust, and makeup can really clog your pores. And that obviously leads to acne. It’s just one of those summer things! 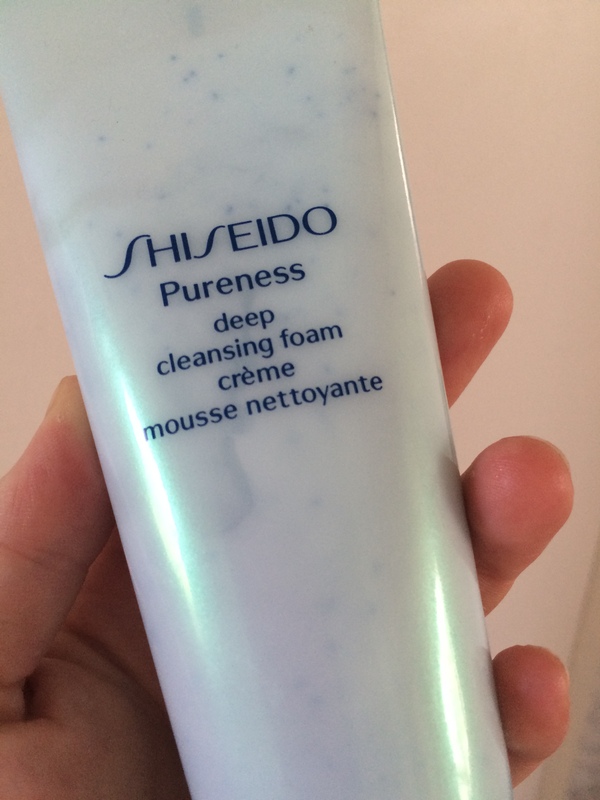 So when I started my Shiseido Ibuki regime a couple of months ago (see my previous blog post), I also bought myself a tube of Shiseido Pureness Deep Cleansing Foam in preparation for summer. This product is from the Pureness range, which is a range targeted at people with more oily, acne-prone skin. According to Shiseido, it is meant to ‘lift away pore-clogging impurities, makeup, and oil that can lead to imperfections’: basically, it gives your skin a deep deep cleanse. It is a blue/white cream with blue granules in it, which foams up beautifully in your hand. It’s actually quite fun to use! The bubbles are silky and fine, and you only need a tiny blob of product to cover your face. The granules have a very gentle exfoliating effect, although sometimes the product that comes out will only have a few granules. So I wouldn’t consider this product an exfoliant, just a cleaner with some exfoliating properties. It has a very chemical smell that I can’t place, which is a downside, and makes me think that it wouldn’t be a good option for someone with sensitive skin. I used this once a week, focusing on my forehead, nose, and chin/mouth area, and avoiding my dry cheeks and neck. For those parts of my face, I used my Shiseido Ibuki Gentle Cleanser. I have small hands so this looks like I used a lot of product, but this seriously was a teeny tiny blob. It foamed up not quite as much as the Ibuki cleanser, but there were still lots of bubbles, and I was easily able to cover my whole face. The results after a couple of months using this were a bit of a mixed bag. It definitely gave me a deep clean: my skin felt squeaky clean after each wash! When I had acne this product did help to clear it up a little, although it wasn’t a huge help. However, I just felt that for my skin, which is normal to dry, it stripped me of too much moisture. It also stung a bit when I had a flare up of eczema around my mouth. Since I still have almost all of the tube left, I think I’ll use it when I’m feeling particularly clogged or have a bad breakout, but I don’t think that I’ll continue to use it weekly. Has anyone else used this product before? Let me know in the comments! Tips for Lipstick Lovers with Dry Lips!